Joel Ewanick is doing his best to blow General Motors' business-card budget. GM's global marketing chief has made another round of changes atop his department. The biggest move: Chris Perry, who in January was tapped to oversee all GM brands as vice president of U.S. marketing, is now vice president of global Chevrolet marketing and strategy. A spokesman said Ewanick wanted more help in crafting marketing strategies for Chevrolet around the world. Ewanick himself was promoted by GM CEO Dan Akerson in December from head of U.S. marketing to the new global post. Since then he has been spending much of his time visiting Brazil and India and other important markets. -- Rick Scheidt, who in January assumed the post of Chevrolet's vice president of U.S. marketing, now leads a new team that coordinates efforts between GM's marketing and product-planning divisions. -- Tony DiSalle, Buick's vice president of marketing, will take over GMC as well. 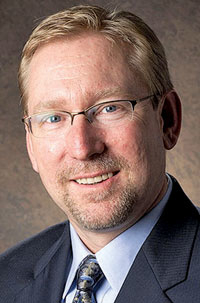 -- John Schwegman, who had been GMC's marketing head, is now executive director for GMC and Chevy trucks on Scheidt's new team. -- Don Butler, Cadillac's U.S. vice president of marketing, keeps his title but picks up added duties as GM looks to expand the luxury brand globally. But regional Cadillac marketing executives will continue to report to Ewanick. Meanwhile, GM will operate without a head of U.S. marketing, with Ewanick overseeing each brand's marketing head.